After feeling the heat in NYC last week and having a long weekend ahead - we decided a little beachside getaway would be the perfect indulgence to keep us happy. So with friends to visit, gelato to be consumed and our Aussie skin crying out for an ocean breeze, we made our way by train to South Hampton. Layers of Linen: Be it on your bed in layers of white and natural, hanging from a curtain rod or on your table, adding this texture to your home will instantly have you feeling fresh and ready for summer. Add an Orchid: Adding a white phalaenopsis orchid is a nice way to add some floral and greenery that will last a few months and these are relatively low maintenance. Get creative with what vessel you use as this can add lots of personality to this classic bloom. You can use a vintage ceramic vase, a clear cylinder vase or even an Italian made washable paper bag from Uashmama. Glass Bass Lamps: This look is quintessential Hampton's. Any shape, any shade will have you nailing this look. I love to keep this look clean and would suggest a clear base and natural texture shade. Ethically Sourced Coral: Instead of anchor motifs and rope accessories, add some completely unique and natural coral to achieve beachside perfect without over referencing. 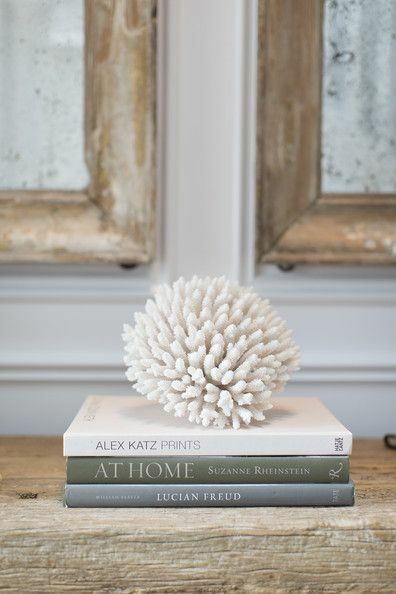 You could hang a piece of framed fan coral amongst your current art collection or add a freestanding piece to your coffee table decor. Shop: Ethically sourced coral is hard to find online so in the US I like to source mine from the gods of neutral and texture - Home Nature . In Sydney head to Lived In Coogee. Hues of Blue: Anything is this stunning palette as pictured above will have you quickly transported to the sea side shores of South Hampton.